Russell Drysdale was an Australian artist influenced by abstract and surrealist art. Sir George Russell Drysdale, AC (7 February 1912 – 29 June 1981) was an Australian artist influenced by abstract and surrealist art. 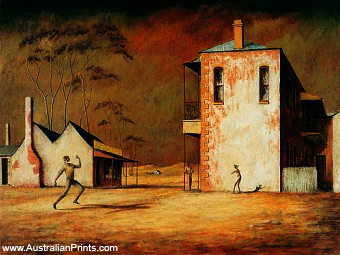 A figurative expressionist landscape painter of Australia, Russell Drysdale was born in England and arrived in Australia in 1923. He exhibited in the first Contemporary Art Society exhibition in 1939, an exhibition that ran counter to the official Government-sponsored Australian Academy. 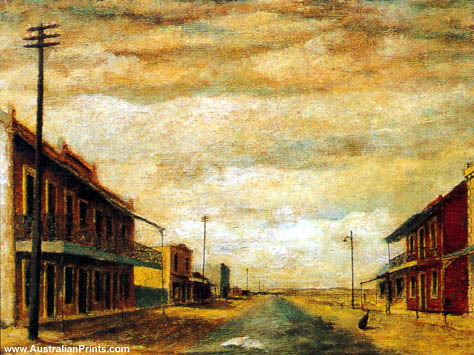 His first one-man show was in Sydney in 1942 where the painting “Moody’s Pub” sold for 30 guineas. The austere, dry barrenness of his landscapes, often peopled with thin gaunt figures, won him fame in Australia and overseas where his paintings reformed the Arcadian delights of Roberts and Streeton into a far harsher concept. He participated in a number of highly prestigious international exhibitions including the 1954 Venice Biennale and has been the subject of many large-scale retrospective exhibitions. Influences upon his work are many but the work of the English artists Sutherland and Moore are arguably the strongest upon his style and imagery. Artist information page for Russell Drysdale. This article uses material from the Wikipedia article Russell Drysdale, which is released under the Creative Commons Attribution-Share-Alike License 3.0.